There are many different online PDF converters on the web. Some can convert PDF to Word, other JPG to PDF, etc. However, not all can boast with being able to convert PDFs to multiple different formats and vice-versa like Easy PDF. 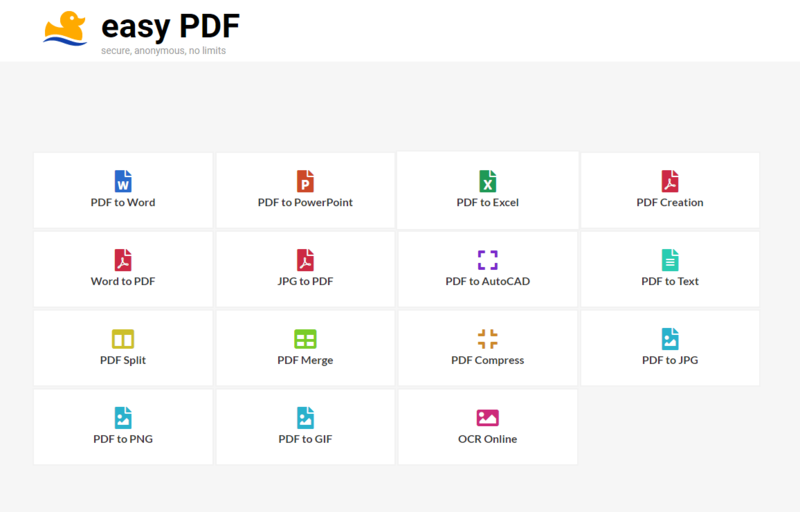 Easy PDF is an online PDF suite that offers all kinds of PDF conversions and creations, but that is not all. It succeeds in doing so while staying completely free, without limitation and registration. That is why this tool outperforms many other online tools. EasyPDF is new on the web with probably not many people have heard about it. So, we wanted to introduce you to this great tool that enables you to convert PDF documents back and forth completely free. You can also use this tool to edit your scanned documents or merge two or more PDF files into a single document. These are just some of the functionalities, for a more detailed list of features read below. Easy PDF can help you with converting PDF to other file formats. Here is the detailed list: PDF to Word, PDF to Excel, PDF to PowerPoint, PDF to JPG, PDF to PNG, PDF to AutoCAD, PDF to GIF. Create PDF covers creation of PDFs from Excel, Powerpoint, JPG to PDF, Word to PDF and many other file formats. To convert PDF with Easy PDF, choose any of these conversions. Then you will have the option to upload a file for conversion. There are numerous ways you can do this. You can add a file from the local storage by searching in the file directory or by drag-and-drop option. Other options are to upload a file from Google Drive or Dropbox. You would need to sign in to your cloud storage account from Easy PDF before having access to your cloud files. The process is the same for both PDF compress, PDF creation, and PDF conversion. Note: You can only choose and convert one file per conversion. PDF Split feature works little differently. You need to upload a PDF file with more than one page. Then you will be able to see a preview of each page in the document. You can then choose where to split the file. 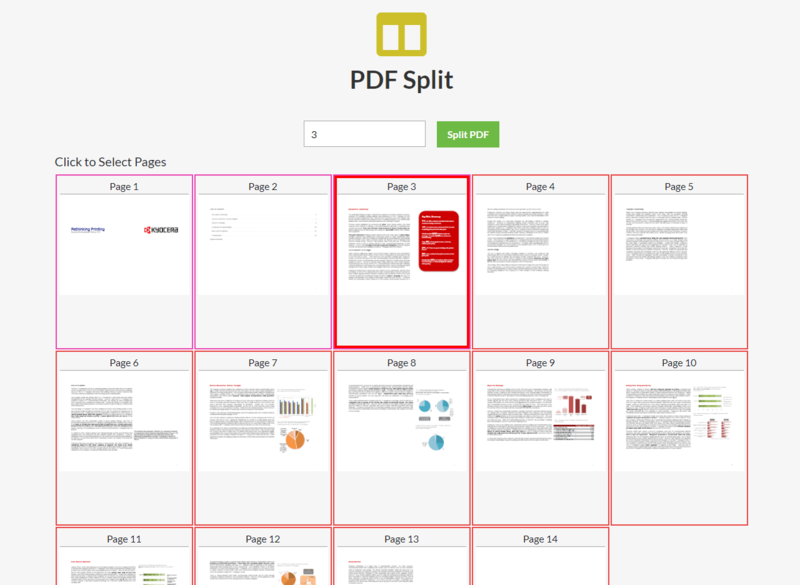 For example, if you select the page number 3 and press “Split PDF” button, then you will get one document with pages 1, 2, and 3. The other PDF will contain all other pages except these three. You can download each file separately or in bulk. PDF Merge works simple – you upload two or more PDF documents. If you add some file by mistake, remove it with the “x” button below it. Then merge files and download a single PDF file. As shown in the previous steps, the app is very intuitive with a clean user interface. It requires a couple of steps to complete any conversion. The fact that there is no registration or logging in makes this tool even easier to use. 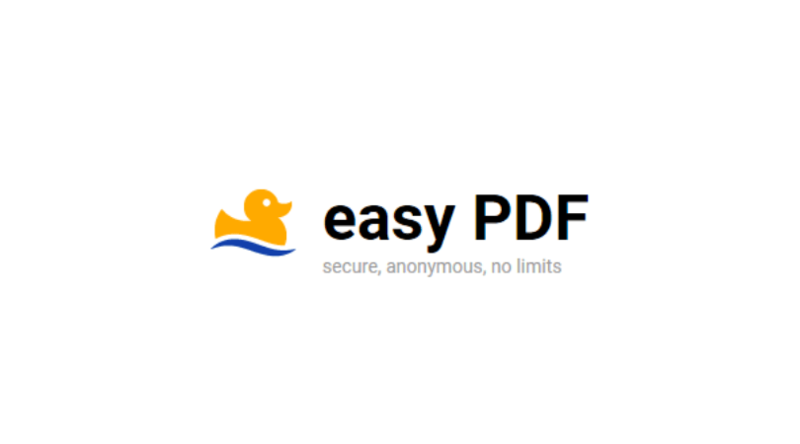 Easy PDF also has no ads that can annoy users in addition to that it is a free tool. Conversions are fast and take no more than a minute to complete. However, it might take more than a minute with some bigger files. You can access Easy PDF on any browser via Window, Mac, Linux or mobile browsers. If you want to find this tool quickly, you can bookmark it for later use. On smartphones, you can add a shortcut of the Easy PDF as an app icon by visiting advanced settings ( three-dot menu) in your mobile browser and selecting to add to home screen. If you need a quick and reliable tool to manage your PDF documents but you don’t want to pay, then Easy PDF is a tool for you. It can help you with any PDF related task, even when you are on the go. It makes PDF conversion easier, a thing you won’t feel like an arduous task anymore.